With more than 220,000 visits each year, we offer emergency care specially designed for babies, children and teens. Call 911 if you think your child's illness or injury is life threatening. Our three Emergency Departments are among the busiest in the nation, seeing an average of about 640 kids a day. Our multidisciplinary teams include pediatric specialists with extensive training and experience. All our staff members are trained in caring for children with urgent health care needs. We combine advanced technology with dedicated, highly skilled physicians and staff to provide care for pediatric trauma patients. Children's is home to the first state-designated Level 1 pediatric trauma center in Georgia, located at our Egleston hospital. The Level 1 distinction is the highest ranking of its kind, and recognizes centers that provide premier care and conduct academic research. Our Scottish Rite hospital contains the state's only Level 2 pediatric trauma center. 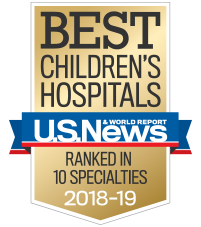 This designation means we have specialists with advanced training in pediatric and critical care available around the clock, along with 24-hour operating rooms and priority status for lab work and X-rays. When seconds count, Children's has a pediatric-trained transport team to transfer critical patients to our hospitals for treatment. Children's transport team members have some of the most progressive training in the industry. Our teams are trained to understand pediatric patients’ needs, and the physical and emotional differences that make treating babies, children and teens unique. We have the only dedicated pediatric helicopter in Georgia. The helicopter is completely customized for pediatric patients and is ready to go at any time. The helicopter is the largest transport helicopter in Metro Atlanta—it can hold two patients, one parent and four care givers if needed. We complete more than 5,000 ground and air transports per year. That means we have some of the highest totals for pediatric and neonatal transport in the nation. Our transport team travels more than 90,000 miles on the ground and flies more than 30,000 miles in the air each year. Our teams treat patients from all over the state. We operate seven pediatric ambulances and two helicopters, all specially equipped as mobile pediatric intensive care unit. Your child isn't just a small adult. Children have growing bodies, and they experience pain and illness differently than adults. They need emergency care designed for children. That's why our emergency medical professionals are all board certified and specially trained to care for children and teens. Our equipment and supplies, from arm slings to blood pressure cuffs, are designed specifically for kids of all sizes, and we know how to make you and your child as comfortable as possible at a difficult time.